Plas-Tech Engineering, Inc., a custom molder specializing in innovative medical components, has selected Medalist elastomers as one of several high-performance alternatives to conventional materials for a new range of single-use syringes, it was announced at MD&M Minneapolis by Teknor Apex Company (Booth 1257). Plas-Tech uses Teknor Apex's Medalist medical elastomers instead of thermoset rubber for the tiny plunger tips or seals that prevent drugs in the tube or barrel of the syringe from flowing backward as the plunger is depressed. 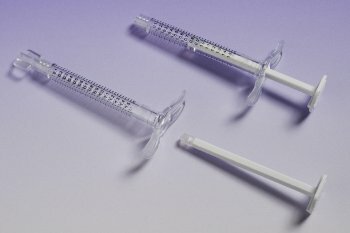 For the plungers and barrels in one series of syringes, the company uses polycarbonate as a durable alternative to polyolefins; for two other series, Plast-Tech molds these components out of cyclic olefin polymer and copolymer, respectively, as shatter-resistant alternatives to glass. While silicone coatings are widely used to ensure smooth movement of the plunger within the barrel, Plas-Tech uses a non-silicone coating to prevent possible interaction with the drug contents. New range of single use syringes from Plas-Tech Engineering. The development of a new material profile for the syringes reflects the focus of Plas-Tech on R&D and its strategy of working proactively with customers, noted president Aaron Hirschmann. "We like to get involved with a project from Day One," said Hirschmann, "and we value suppliers who have the same attitude. Early on, Teknor Apex saved us a lot of work because it provided toxicology data for its entire range of Medalist elastomers, helped us to pinpoint the grades that were best for the application, and supplied us with the small samples we needed for R&D." Of close to three-dozen standard grades in the Medalist range, Plas-Tech chose two compounds for the plunger tips: translucent Medalist MD-145 in the polycarbonate syringes and clear Medalist MD-555 in the cyclic olefin syringes. The MD-555 grade was chosen for its compatibility with cyclic olefins, which can undergo stress cracking upon exposure to many TPEs. Both Medalist compounds withstand gamma and autoclave sterilization, resist degradation by or interaction with drugs, and provide the low compression set and high resistance to heat aging necessary to maintain seal integrity, according to Lisa Charno, medical market manager for Teknor Apex's Thermoplastic Elastomer Division. "As thermoplastics, Medalist elastomers process at higher rates than traditionally used polyisoprene rubber and permit cost-effective production in high-cavitation and hot runner injection molding," Charno said. "Their consistent shrinkage allows for extremely tight dimensional tolerances without trimming or other post-molding processes." The new syringes from Plas-Tech currently are used in cosmetic surgery. The company supplies the three series of syringes in 0.5, 1.0, and 1.5 cc standard sizes and can produce syringes on a custom basis as well. The Medalist range of medical elastomers includes many standard high-purity elastomer compounds, along with a comprehensive body of test data and resources for designers and processors. Compounds are available with hardness from Shore OO 25 to Shore A 87 and include clear, translucent, and opaque formulations. An expandable registered binder with extensive data on Medalist products is available to qualified OEMs, designers, and plastics processors in the medical device and healthcare product industries. It can be requested from the Medalist website at www.medalistmd.com or by emailing Teknor Apex at [email protected].